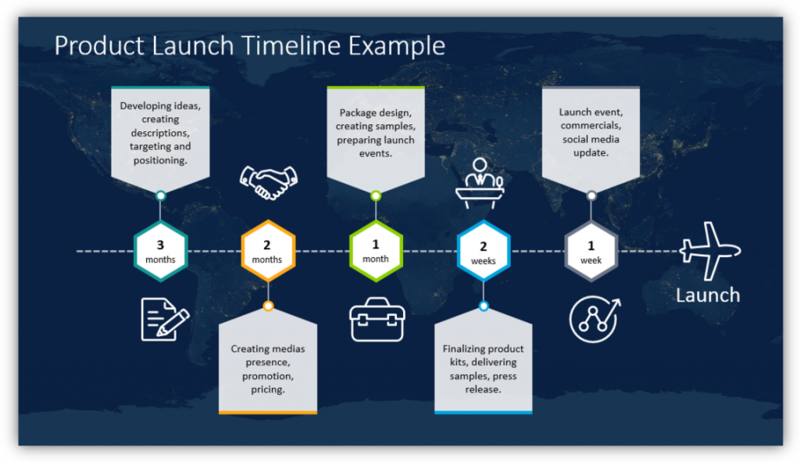 Present product launch schedules, project development phases, or any other timeline using creative visual metaphors. 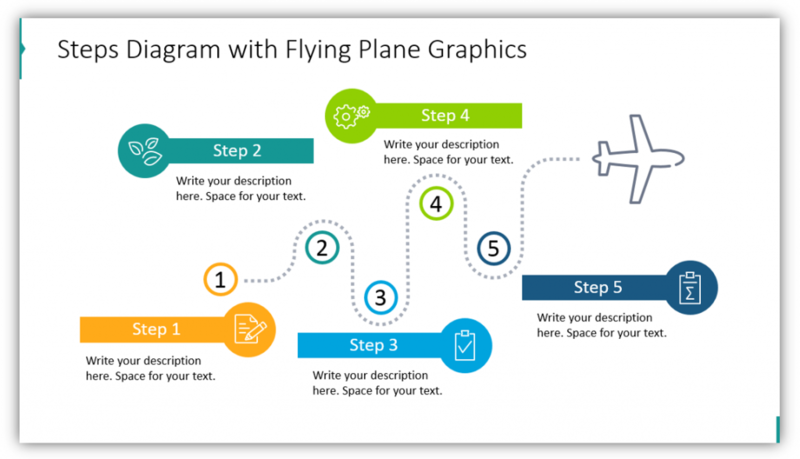 Airplane flight trajectory graphics are colorful and attractive so you can explain a project or process from the start, through the development, until the end. You can add additional milestones or steps required to reach the final destination if necessary. All example slides below are accessible in Plane Flight Timeline PPT Diagrams. 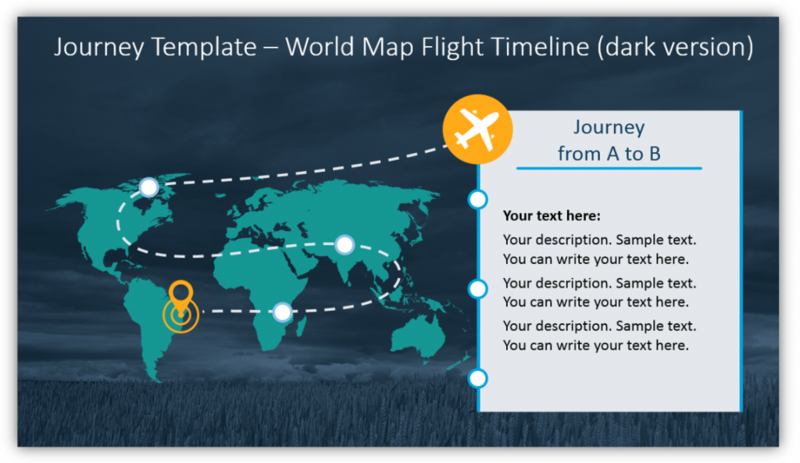 Using this template you can provide as many details as you would like about your journey. 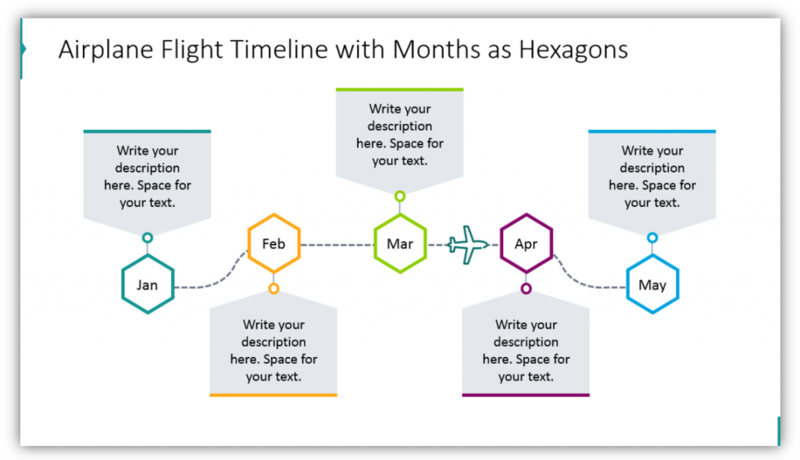 You can share literal details about an actual logistical process or use a map as an analogy for phases of another timeline. Whether you decide you would like to have your graphics overlay onto a light background or a dark background, you can customize the colors of the graphics to ensure your message is always easy to see and understand. 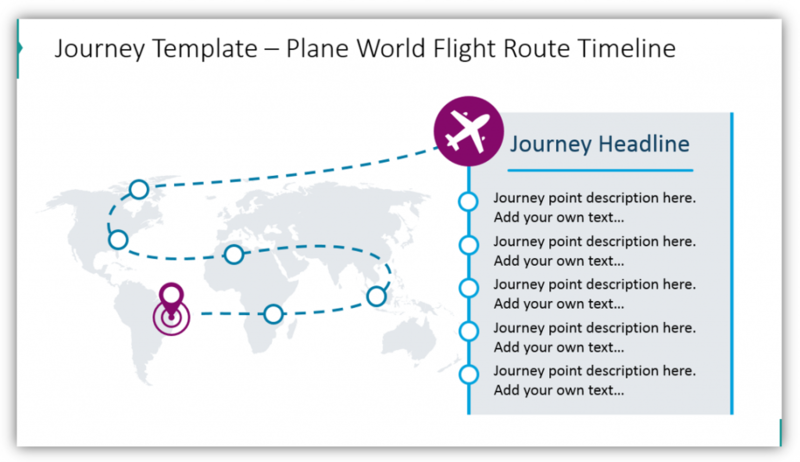 If you’re not certain that your metaphor requires a map underlay, you can always use your flight timeline graphics without a background. In this example, you can describe the steps or pit-stops of your timeline with labels and icons and provide supplementary information in descriptions. 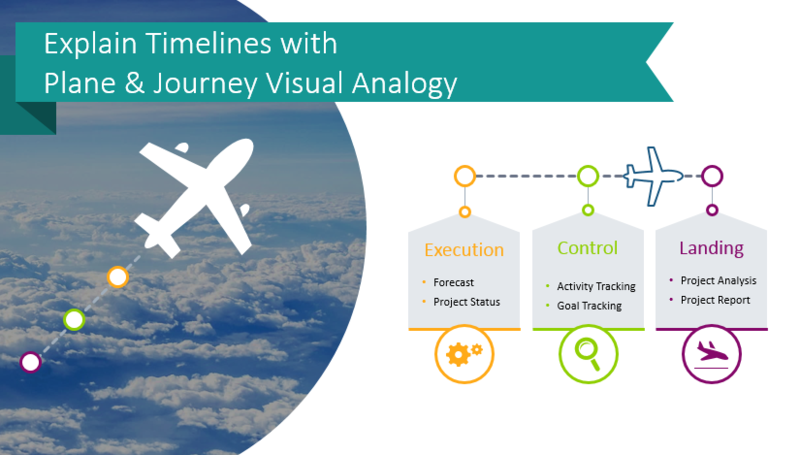 Don’t forget, whether you’re describing a timeline for completion, setting goals, or explaining development phases you can always put your airplane at any point. You don’t always need to represent your plane as being at the beginning or end of the timeline. It can appear at any point in the process or even serve as a marker as you propel through the different stages. If the timeline or process you’re discussing is more linear, such as the passage of time, you can incorporate a linear flight trajectory. Your milestones don’t need to be years, you can adjust the timeline to months, weeks or any other time periods. Short labels or icons to mark the points on your timeline are sufficient. You can add supplementary information in attached labels or additional text boxes. You can have fun with the design by adding icons to represent each stage. When describing the linear passage of time, you don’t need to only think in terms of years. 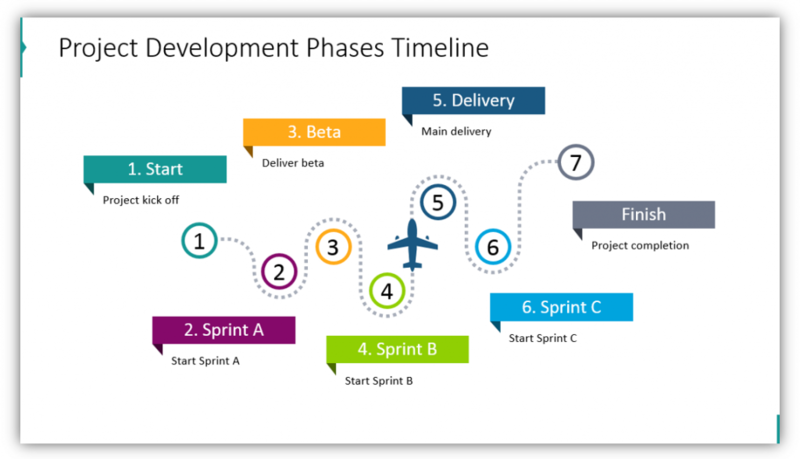 If you need to present the timeline for a software development phase or describe a certain stage of the process you can use shorter stretches of time. When applicable use maps to accentuate your flight trajectory slides regardless of whether or not they are linear. The timelines you present can have numerous, detailed steps. Rather than only marking the passage of time, remember you may also mark and explain different accomplishments, goals, and milestones. Providing visual elements will keep your audience engaged and will help them remember what you’ve shared hours, days, weeks, or further down the road. 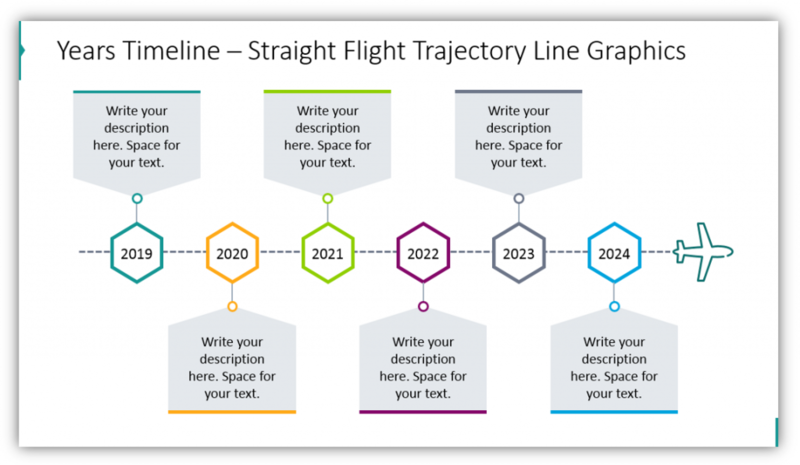 By using a familiar situation, a flight path, you’re ensuring the new information your audience needs to retain is only the new information you’ve shared, Flight trajectories are simple, common concepts. You aren’t asking them to learn a new framework AND remember the rest of your message. Since these icons and slides are largely done for you, it’s easy to benefit from relatable graphics. All you need to do is tweak the slides from this set to match your purpose and customize them. You can also download the infographics collection for more presentation graphic variety.